This arts and crafts end table features the classic mission styling with clean lines and slat detailing on each side, providing your home with comfortable and inviting atmopshere. The dark metallic pull hardware accents the drawer, giving the piece idyllic detail. The drawer can be used for remote controls or reading glasses, allowing you to have a convenient place to store your essentials. The bottom shelf can be used to display your favorite reading materials of a loved picture frame. The top is constructed from solid one inch thick face-glued Red Oak to give the piece a quarter-sawn oak appearance, giving your home a beautiful look. The Arts and Crafts End Table with Drawer and Shelf by AA Laun at AHFA in the area. Product availability may vary. Contact us for the most current availability on this product. Handles & Hardware Dark metallic pill hardware. Description: Top Solid one inch thick face-glued Red Oak tops to give each piece a quarter-sawn oak appearance. Case Construction Crafted of solid Red Oak and some veneer panels. Bring this charming Arts & Crafts collection into your home and achieve an inviting atmosphere and a transitional look. Clean straight lines and panel details along with the dark metallic hardware illustrate the classic mission style. All tops are constructed from solid one inch thick face-glued Red Oak to give each piece a quarter-sawn oak appearance. Doors are assembled with fashionable dovetail key joinery accented by reversible inserts, either matching oak veneer or contrasting black panels. These occasional tables will embellish your living room, family room, den, or any other area in your home where you need extra storage space and an idyllic accent. 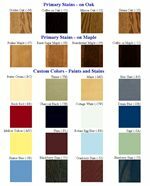 This collection is also available in our other Custom Color stains and paints to accommodate your personal style and individualized home.